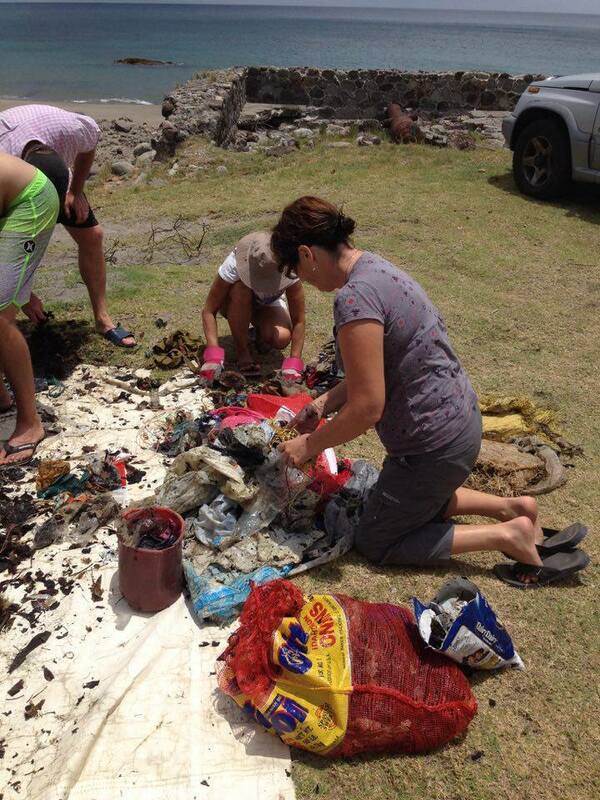 Montserrat Island Dive Centre photo of some of what is collected at an Adopt a Dive Site clean up on Carrs Bay beach. Adopt a Home for Wildlife is a Montserrat National Trust (MNT) initiative to conserve and enhance the beauty of Montserrat. A local company has put there own spin on it and Adopted a Dive Site. Montserrat Island Dive Centre has adopted the Carrs Bay and Little Bay beaches and the surroundings in an effort to keep them as attractive locations for their divers and residents to enjoy. The national trust has been looking partners in the community to lend a hand in keeping our island beautiful, clean and full of unique wildlife and habitats. The Adopt a Home for Wildlife campaign allows individuals, organisations, community groups and businesses to agree to maintain and protect a public space for a year at a time, with renewals annually. The programme runs all year round, and gives you the opportunity to make a difference in your local area. 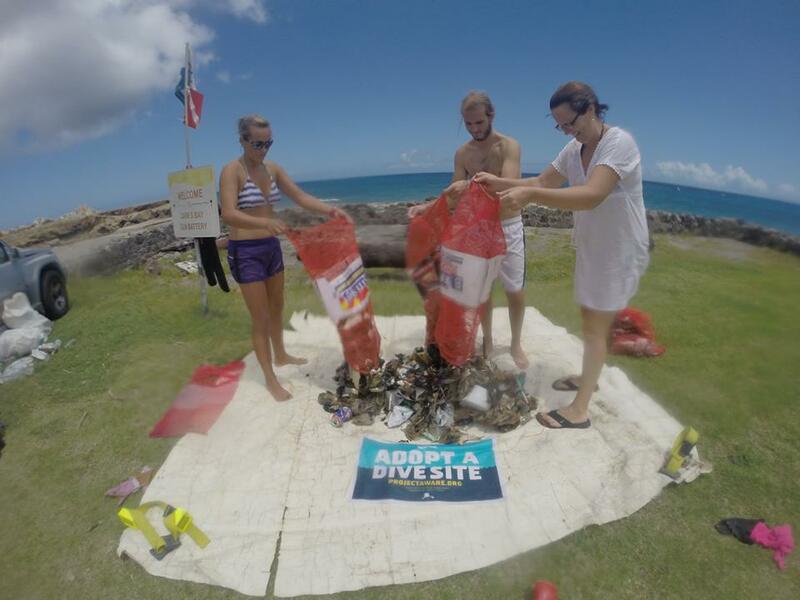 Montserrat Island Dive Centre, led by Jay Steed and Charley Bartlett, have committed to conducting both underwater conservation and beach clean-up operations on a voluntary basis. The pair saw the Adopt a Home for Wildlife as perfect synergy with Adopt A Dive Site project, which is part of Dive Against Debris, coordinated by Project Aware, the environmental sister company of the diving standard-setting PADI (Professional Association of Diving Instructors). Charley is a PADI AWARE Dive Against Debris Instructor and regularly trains other willing divers on the importance of removing marine litter, so that they may spread their impact even further from the shores of Montserrat. On a monthly basis, a team of divers takes to the waters to collect marine debris from the reef while a second team collects along the shoreline the plastic bags, cutlery and cups which usually come out on top. Volunteers have come forward from government offices and school groups as well as local conservation organisations and concerned members of the community. “The Carr’s Bay site is adjacent to the Collins Ghaut and Carr’s Bay terrestrial site, which sees a great accumulation of debris washed down from the hillside residential development. Little Bay is the site most commonly referred to for tourism and port activity development. Future hopes are that general education and proper waste disposal become a stronger focus, to minimise the overall effect a small island community like Montserrat can have on the ocean. “The work undertaken includes delicate removal of fishing line and clothing entangled around and smothering corals, as well as the careful retrieval of beverage cans, bottles and other trash items that lay strewn across the reef. On average, the dive team remove 30 kg of debris from underwater while, at the same time, a further 30 kg are collected from the beach in an attempt to stop the rubbish even making it to the waterline. The majority of trash collected is of plastic origin; along the shoreline, polystyrene and plastic cutlery are the biggest burden,” the UKOTCF newsletter revealed. Why Adopt a Home for Wildlife? Montserrat is a special island with much to celebrate. We Montserratians are renowned for our welcome and hospitality. We are connected to our island’s environment as we depend on it for so much, e.g. the water from the Centre Hills, and the natural remedies from our plants. Some areas, which are so important to our way of life, are under threat because of the actions of a few: for example, dumping of rubbish, which stops the flow of the streams after heavy rains and attracts flies and mosquitoes. This programme gives us a chance to put these things right by caring for our island and showing others that we appreciate what makes us so special. • Adopting an area promotes a cleaner, more liveable neighbourhood and gives YOU an active role. • You can give your group/business/family positive attention for the valuable service you provide. • You help Montserrat, your island, by volunteering to clean up and maintain its uniqueness.